Dough Girl and I decided to bake today when we hung out. She wanted chocolate chip cookie dough cupcakes. I wasn’t quite sure what she meant, but I figured she wanted raw cookie dough. Sally’s Baking Addiction used cookie cups, but that sounded like too much chocolate chip cookie, so I adapted a vanilla cupcake recipe from the Joy of Baking to omit lemon zest. 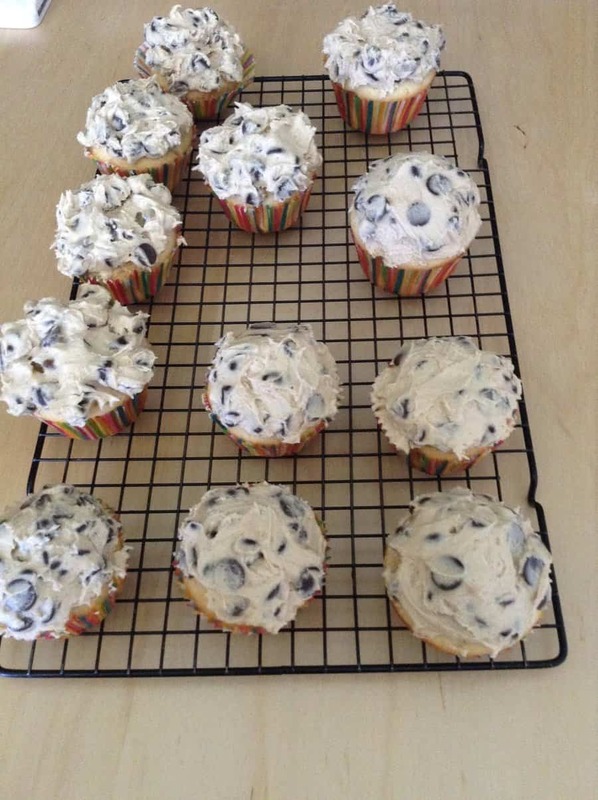 And ta da, I had chocolate chip cupcakes with chocolate chip cookie dough frosting. We used normal chocolate chips in the frosting, since I had no mini ones; however, I highly suggest you use small chips or chop up a block of chocolate by hand. As you might be able to tell from the picture, the chocolate chips are pretty big. Taste wise it’s fine, though it makes frosting the cakes a pain in the rear end. The chocolate chip cupcakes were pretty fluffy, though fairly plain. Dough Girl enjoyed licking up the raw cake batter; this is a common trait we share. This also may be the reason why the final cupcakes were a wee bit on the small side. In middle school, when we were in the same cooking class, the rest of our peers looked on in horror and disgust while we lifted spoonfuls of raw blueberry cheesecake batter to our mouths. Aaah, good times. The chocolate chip cookie dough frosting is the big star. It’s a whippy, eggless chocolate chip cookie dough. It is pretty rich, but I suggest you use all the frosting to make sure that the cake to frosting ratio is right; I didn’t quite use enough, and I thought there was too much cake. Don’t worry about the flour; it’s what makes cookie dough cookie dough. You can’t even taste it. On a side note, if you don’t care for raw cookie dough, you might not like this. However, my mom doesn’t, but she still enjoyed these, and claimed that the cookie dough just tasted like frosting. Beat the butter and sugar until light and fluffy. Add the eggs, one at a time, beating well after each addition. Beat in the vanilla. On low speed, alternately add the flour and milk, in three additions, beginning and ending with the flour. Fold in the chocolate. Fill 12 lined muffin cups. Bake at 350F for 17 -20 minutes or a toothpick comes out clean. Cool on a wire rack. Frost cooled cupcakes. Cream the butter and sugar. Add the vanilla. Stir in the flour and salt. Beat in the milk. Beat in the chocolate.